This beautiful digital illustration of a tree frog watching insects is printed on 250g Fine Art Watercolor Paper. 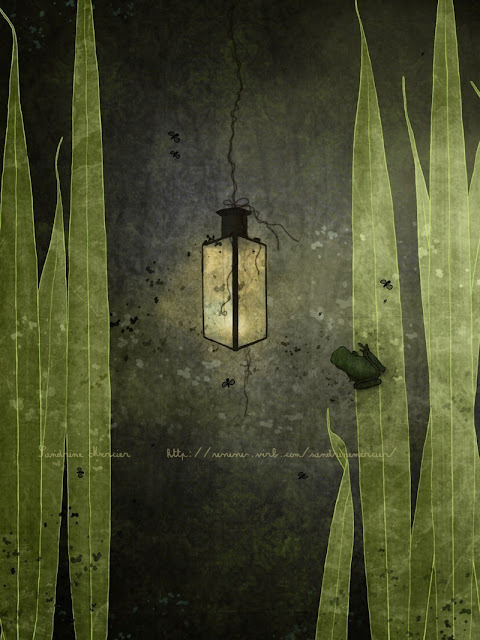 It perfectly captures the mystery of the shadows and the light around the lamp. Absolutely lovely! Signed and date by the artist. 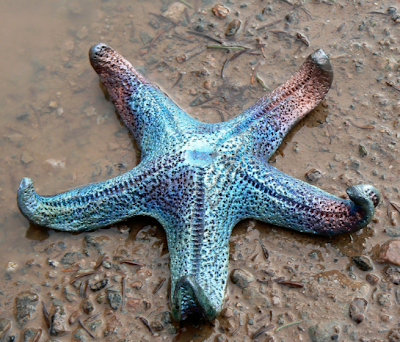 These unusual raku pottery starfish are handmade by Sarah Beck on Cape Breton Island, Nova Scotia, Canada. Each one is approximately 6” from tip to tip and unique. They vary depending on how they are curled and fired. 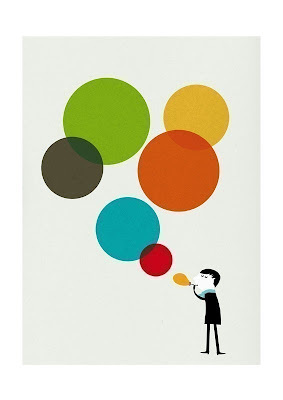 The colours range from dark green to blue to copper. They look great on their own or in groups. Giclee print of an original pen and ink drawing. Print measures 8 x 11" on 11 x 14" paper. Printed on Hahnemuhle's Photo Ultra Smooth Rag using vivid ultrachrome pigment inks. A handmade trug filled with a selection of homegrown fruits including bananas, apples, oranges, pears, plums, apricots and grapes. 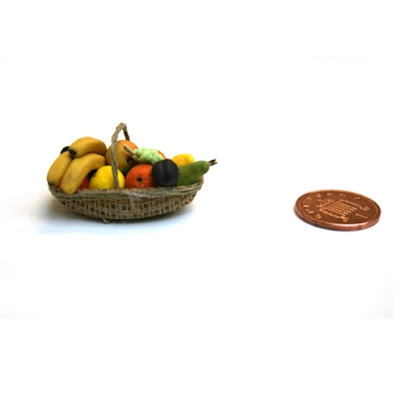 Handmade from fimo for a 1/12 scale dolls house or just for someone who likes small things! I can't believe the amount of detail involved, a real skill. 1” (2.5cm) pin back badges in all the letters of the alphabet. 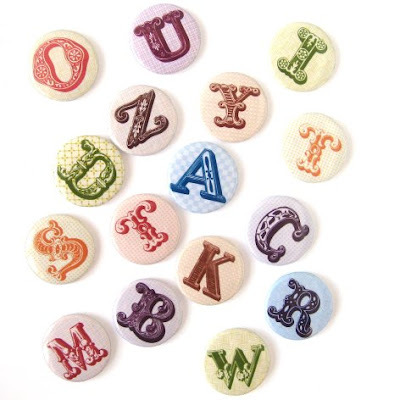 Beautiful ornate lettering on patterned backgrounds made into little badges to adorn yourself with. 1 or 2 badges come on a printed backing card. 3 or more are packaged in cellophane and card packs. If this is a gift just fill in the back with lucky recipients name. These make lovely gifts, children’s party bag favours or look great pinned on your collar. 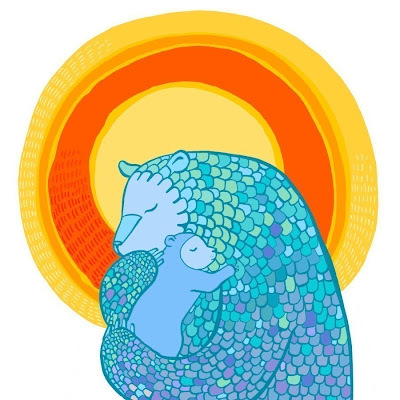 Beautiful and fun, this original illustration is printed on a grain satine soft 100% cotton paper. Size: 14 x 21 cm (5.5" x 8.2"). 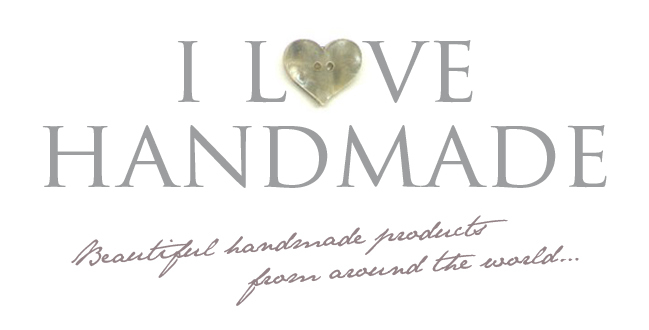 I only discovered this shop today, but it may be my current Etsy favourite! Wonderful! 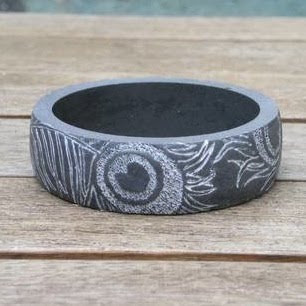 Chunky resin bangle etched with flowing peacock feathers that carry with them their natural ostentatiousness. This bangle was definitely created to impress. Designed and made in the UK. Available in ivory or slate finish. A gorgeous faceted Green Amethyst briolette has been wrapped with oxidised sterling silver wire and strung onto a fine sterling silver chain. Beautiful, simple and elegant. 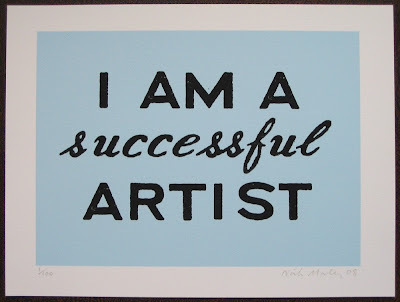 From a series of prints with slogans, this is linocutboy's message to himself when doubt creeps in! Archival giclée print on acid-free 225g Somerset Enhanced paper. 8.25 x 11in (28 x 21cm) Signed and numbered in an edition of 100. 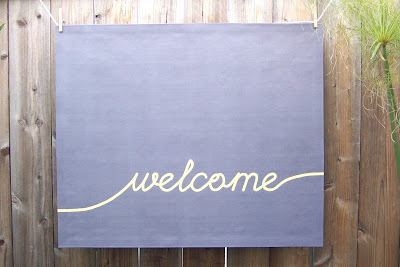 Welcome your guests with this handmade canvas floor mat. The mat is made from heavy weight gray canvas with folded edges, painted with yellow script and sealed with 4 layers of floor grade polyurethane. The mat can be simply wiped clean with a damp cloth when dirty. 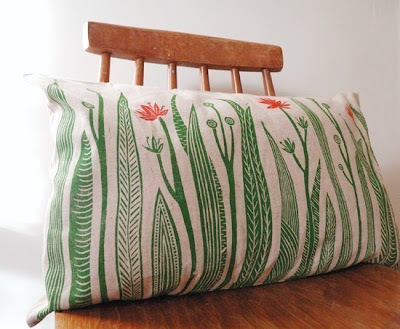 An organic looking cushion cover with green leaves and red flowers. Cushion cover measures 11.5 x 19 inches. Design is hand carved from lino and hand printed. 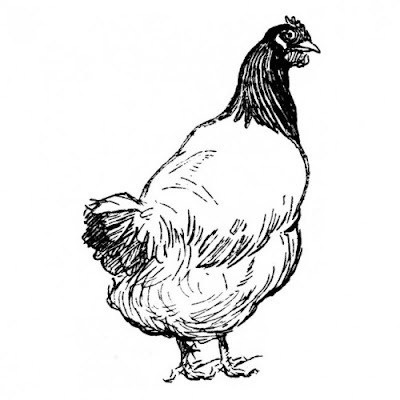 Henrietta stands proudly and glances back over her shoulder at you…wondering…do you plan to steal her eggs yet again? This charming vinyl wall decal is 17" tall x 11" wide and is waterproof and fade resistant. Easy to apply and can be used indoors or out. Black ink on off-white German Zerkall 170gsm acid-free paper. 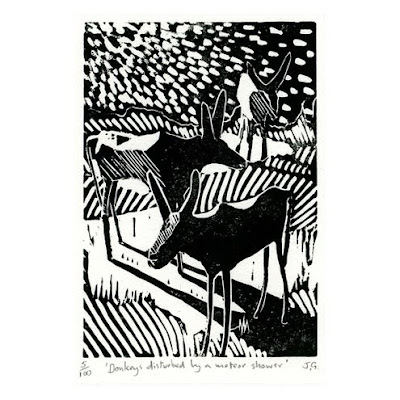 From an edition of 100, signed and numbered by the artist. The print image measures H10xW7cm. 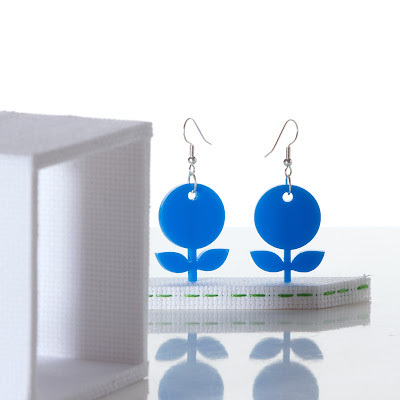 These retro blue acrylic earrings remind me of The Magic Roundabout. Really fun and original. The pendant is 3.5 cm high. 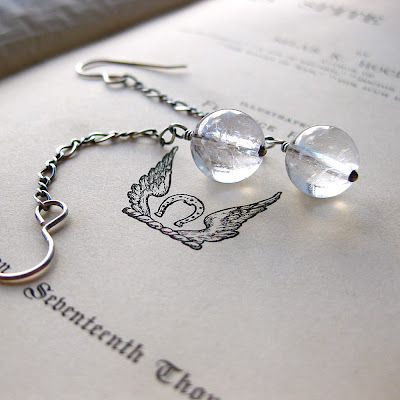 The complete earring is 5.3 cm high. Available beaming blue, dazzling green or bright pink acrylic. Designed, produced and hand-finished in London. 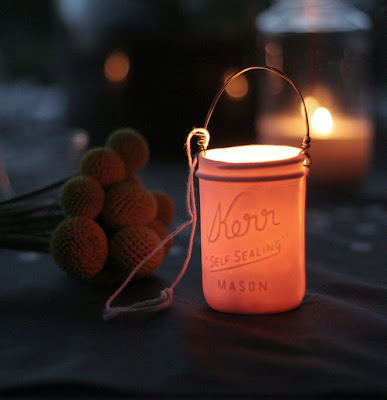 This beautiful lantern is a porcelain cast of a Kerr Mason Canning Jar that gives off a lovely glow inside and out when lit. Hand-wrapped black galvanized steel wire is attached for hanging. Perfect for a summer patio or to brighten your winter garden. Comes with a votive candle inside. Available alone or as a set of two. 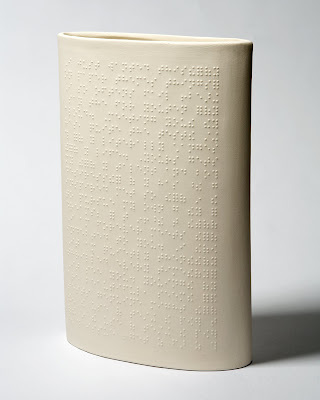 This fascinating 10" vase features collected love letters, received by or given to participants of the 'Love Is Blind' project. These letters have been transcribed into Braille and transferred in relief pattern onto the surface. Unusual and very beautiful. 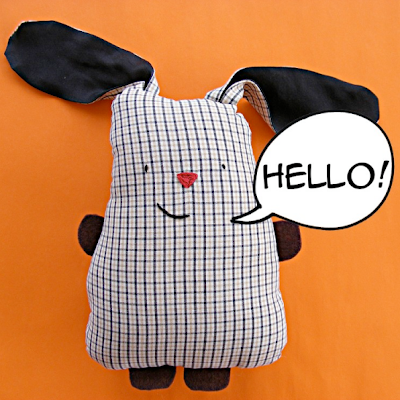 This Shiny Happy Bunny is made with love from recycled fabrics. Each one is unique, #23 is made from black and brown plaid pyjamas, felt scraps and black silk from a scarf. He's also safe for babies – no buttons or tiny bits. 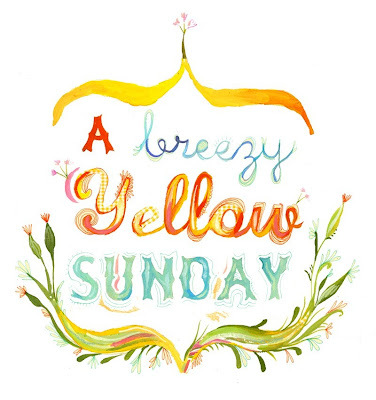 A sunny Sunday illustration to remind us that Spring is near! A high quality inkjet print of an original watercolor illustration by Katie Lombardo. Signed by the artist. 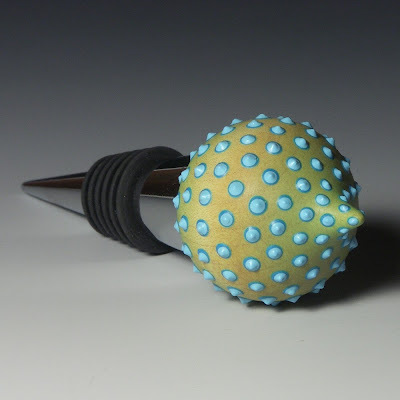 Inspired by tropical marine life, this unusual bottle stopper is made from maple. The wood is turned, airbrushed with acrylic inks, 'blobbed' with acrylic texture paste and finished with a non-toxic environmentally friendly wax. The base of the stopper is a chrome plated cone with a rubber seal. Great as a gift with a bottle of wine, or to liven up your olive oil bottle! 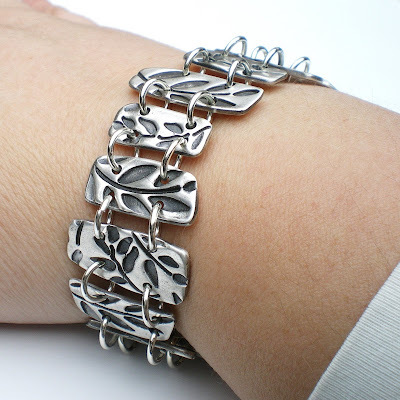 An unusual, but stunning handcrafted silver bracelet. Made entirely from Silver PMC (0.999% Silver), this beautiful piece is created to order and entirely unique. Each wavy free-form section has a dark patina which is then polished to give a beautiful contrast between the light and dark. Silver PMC is made entirely from reclaimed silver, making it a fantastic environmentally friendly choice! 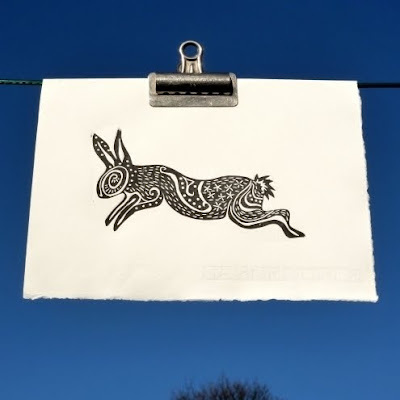 Original lino cut print "Spiral Rabbit in Black". Inspired by Alison's archaeological work and with more than a nod to Watership Down. Printed with oil-based inks onto Zerkal Printing Paper. Beautiful! Valentine's Day may be a distant memory, but wedding season is nearly upon us, and wouldn't this be a great way to propose? A fantastic gocco printed 2" wooden block with gift tag and bag. 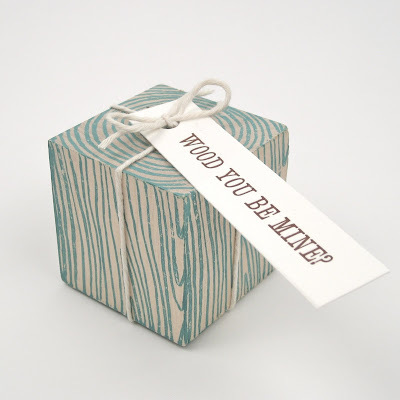 This block is printed in pool blue, other colours may be available if you ask very nicely! Everybody loves blowing bubbles, right? Beautiful retro A4 "Monsieur IV" print. 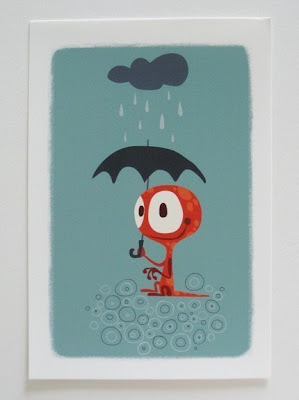 Printed on archival matte paper, and signed by the artist. 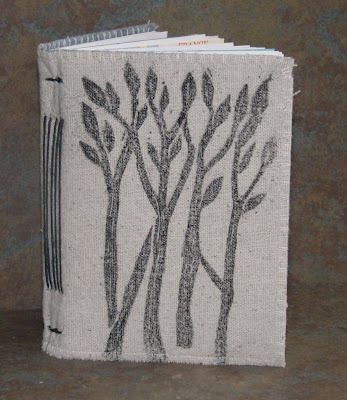 This beautiful handmade journal is covered with linen that has been printed with hand cut lino. Great journal for recording those secret thoughts, deepest moments, reflections and goals. Nice sized journal (4" x 5.5") to keep handy! James Victore is a dinner plate pirate. 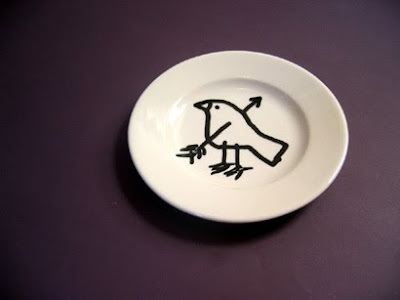 Spontaneously hijacking unsuspecting porcelain with a fat black paint pen, he marks his bounty with drawings of skulls and birds and fish (dead ones). Each one of Victore's plates is drawn by hand and is a completely unique work of art. 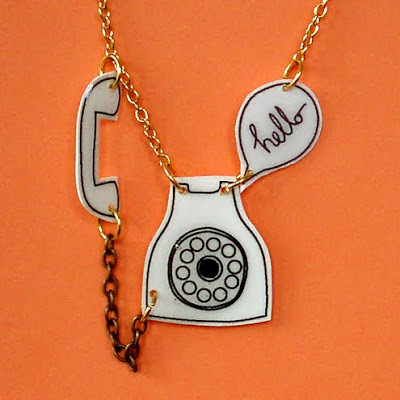 Super vintage phone necklace with hanging rustic receiver and "hello" speech bubble. Pendant measures approx 1" and hangs on a 18" gold plated chain. It is created with a lightweight plastic and coated in a super glossy resin. Roll up! Roll up! Ladies & Gentleman meet Monsieur Alphonse Poissonnier, Ringmaster extraordinaire, leader of the World Famous Cirque de Chaussettes. 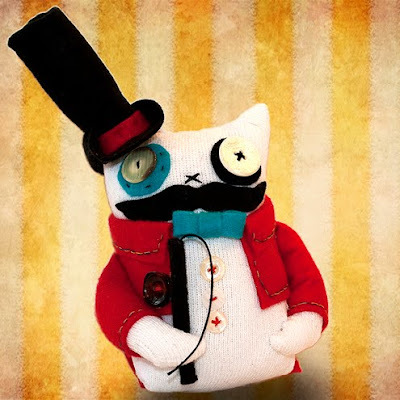 Monsieur Alphonse has been totally hand sewn from a new, clean, white sock. He wears a red felt fish tail coat, carefully embroidered in contrasting threads, with button detailing to the front & back. He wears three none matching pearl buttons down his chest. In his right paw he carries a hand sewn whip, made from felt & embroidery thread. Over his right ear he wears a hand sewn tophat with red trim. His rather suave looking face comprises of none matching button eyes, a tiny embroidered nose & a gorgeous black felt moustache! 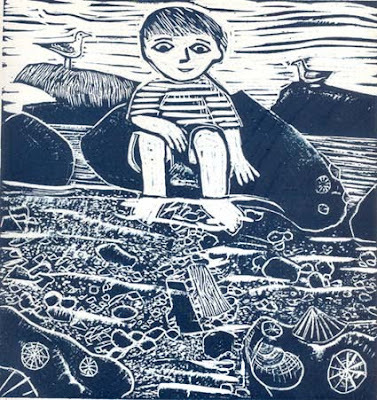 I absolutely love this beautiful single colour lino print – the joy of floating a little driftwood boat in a rockpool! 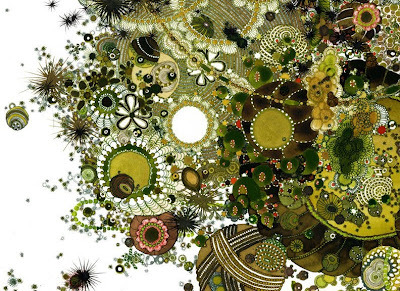 Ed Boxall is an artist and illustrator and lives in the seaside town of Hastings. He also writes and illustrates children's books, you can get hold of copies here. Wonderful stuff! Undeniably opulent and elegant, this striking scarf is hand woven in a luxurious cotton blend. Soft and lightweight, it is ideally suited for year-round wear. 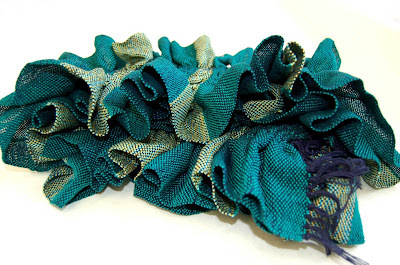 Meticulously crafted and executed, featuring many thousands of threads, this 'shades of blue' scarf is irresistible! 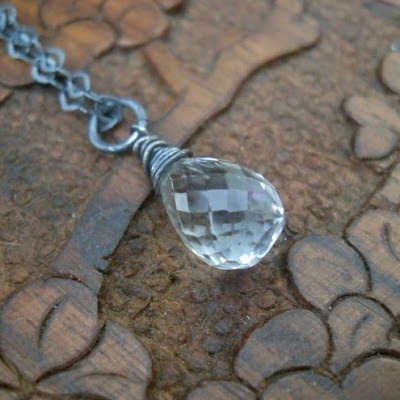 Mystical crackled quartz – for your mysterious side. These sterling silver earrings elegantly combine crackled quartz on a figaro chain and simple ear wire. From Rachel Lucie's new 'Modern Times' collection. Limited edition of just 75. Archival print of a pen and ink drawing which has been digitally coloured. Printed on gorgeous museum quality Hahnemuhle German etching paper with vibrant pigment ink, this print has a lovely weight and texture. Signed, numbered and dated.